Oh great, I was hoping to have to deal with a crazy drifter and his rabid dog along with this damn spider. Oops, I thought we were still waiting on Jenny. Vincent gets smarter. Thanks to the Crux of Cykranosh, Vincent maxes out his Lore at +2 (for a total of 3). Pete is defeated. Doom advances by 1. 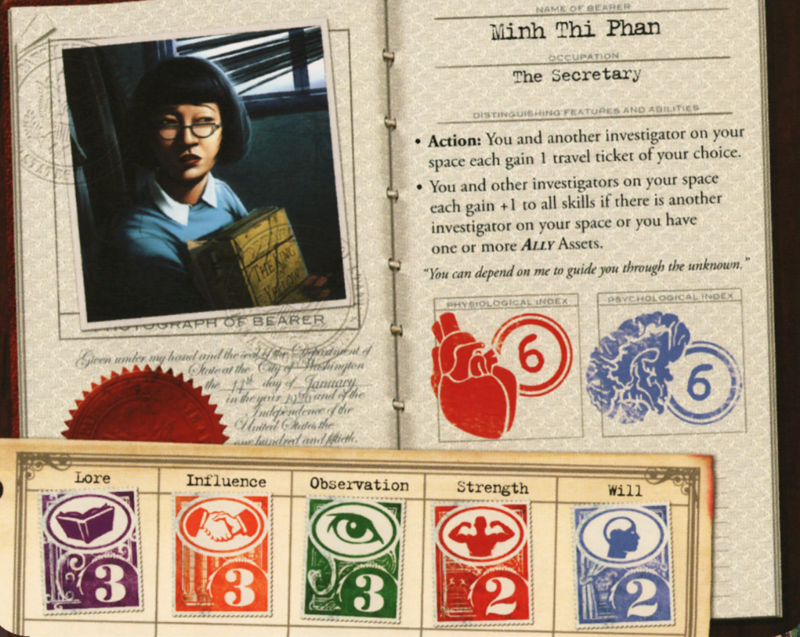 Pete moves to 17 or Shanghai (your choice), where you can encounter him to relieve him of Duke and the Lantern. 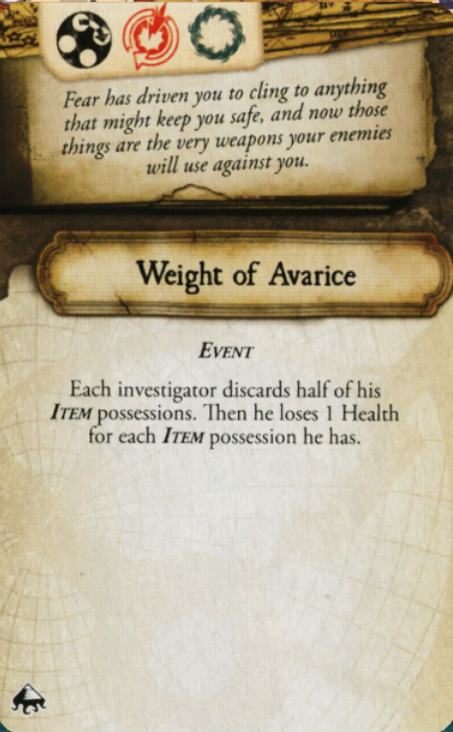 The good news is that the replacement investigator enters play at the end of the mythos phase, so he or she won't run afoul of its consequences. The Omen is now blue. There are two blue gates open, so Doom advances another two. Doom is now at 7. Atlach-Nacha: Spawn a gate or toss out some spells? The next gate will spawn in Sydney. Eye of the Storm: Back to 1 token. It Could Be Worse: Vincent loses 1 Sanity. Choose how you'll respond to Atlach-Nacha's reckoning first. Vincent has three Items (Crux, Shotgun, Bandages) and must discard two. The Crux is no longer necessary, but it can still provide extra Strength if Vincent acquires a spell. Hank has four Items (Sledgehammer, Forbidden Text, Otherworld Codex, Livre d'Ivon). Jenny has six Items (Lucky Talisman, Fine Jewelry, .25 Automatic, Arcane Tome, Tommy Gun, Whiskey). Ouch? Please welcome Minh to the fray. 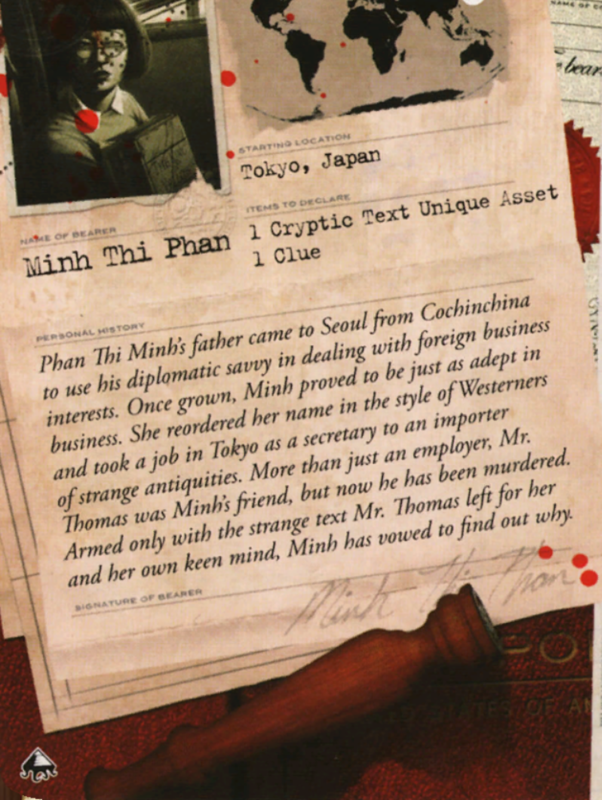 She starts in Tokyo (which is basically the same as Ho Chi Minh) with a book and a clue. Last edited by Mogri; 10-19-2018 at 11:59 AM. I think spawning a gate is better...still need to close gates with clues to keep that rumor at bay. But I don't know. I guess I ditch the Livre and the Forbidden Text? I was going to try to use the Livre to get out of Antarctica, but to have a chance at that I'd have to ditch the Sledgehammer too, and what is my character good for if not for fighting things? Jenny could go to the Himalayas instead to help with Spiders, or go somewhere to get a clue, if the Dhole is going to be a big issue. Let's hold onto our weapons. We've got plenty to fight. I'll ditch the crux and bandages. I vote we spawn the stupid gate. World's going to hell anyway. Let's drop the Whiskey, Tome, and...I'm thinking either the Jewelry or the .25? Still wanna stay at London, probably best at this point to try to just fight the Dhole and close the Gate. I think in that case, I'll drop the Jewelry. Does that sound okay or stupid? Jewellery isn't bad to ditch, but I think the .25 is redundant after the Tommy gun, no? Does anyone have any clues? We need clues to keep the rumor from killing us. Mogri's said that they do actually stack (since the .25 is +1 die, while the tommy gun is simply +4), which is why I'm leaning toward both. Last edited by aturtledoesbite; 10-19-2018 at 07:23 PM. Minh starts with one so if we let the gate spawn in Sydney she could buy a ship ticket and head down there and try to close it right away. I’m probably just going to use my inherent talent to take a nap wherever the hell I want and rest up before trying to finish off the brood. I’ll start heading towards London after that. Waiting on anyone in particular or we just losing interest in getting our butts kicked? I don't think turtle made a final decision on Jenny's items. Now that I take another look, we need Hank's final decision, too. Meanwhile, a Gate opens in Sydney, and a Shoggoth springs forth: Will 3, Strength (-1) 2, 4 toughness, and it regains all health on Reckoning. A second Gate opens in Shanghai (red, like Sydney). It comes with a Cultist, who immediately moves to your choice of 17, 19, or Tokyo. Finally, you need to decide if Pete will make 17 or Shanghai his final resting place. I thought Pete was dead and I was a new person? He’s gone bonkers and you are now someone new, but we get to decide where he wandered off to. Do we have to fight him to get his stuff or no? Can’t remember. I vote we send Hank to 17 and the cultist to 19 for no particular reason. Not a fight, just an encounter. You're guaranteed to get his stuff, and with a skill check, you get another bonus (often retreating Doom). Ditching the Livre and text is fine for me. Also fine with 17 and 19. 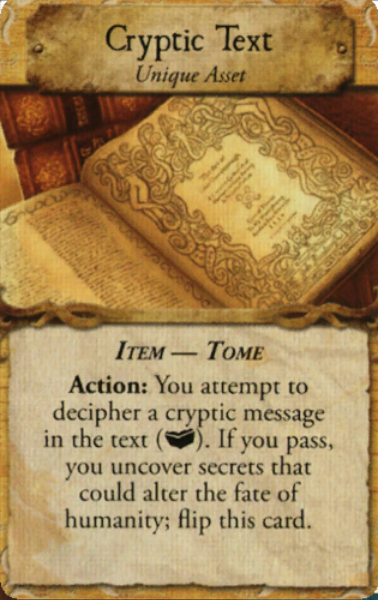 Replacing Private Care in the Reserve is Occult Grimoire (+3 L when resolving Spell effects, reduce horror of Monsters you encounter by 1 to a minimum of 1). The other Reserve cards are Bodyguard (+1 S, reduce damage of Monsters you encounter by 1), Witch Doctor (anyone who Rests on your space additionally either gets +1 Health or discards Cursed), and Fine Clothes (6 = two successes during Acquire). Last edited by Mogri; 10-31-2018 at 06:39 AM. I believe the Leng spider on my space was defeated. I’m planning to rest (I think my special ability allows me and anyone else on my space to rest even when monsters are present from what I can tell), then just hang tight and take another crack at the Brood. Clue encounter if I’m successful. I think I should have 6/8 stamina (only got hurt by the Ghast) abs my +1 W is gone. I think my only real options are to try to kill/gate close either at Antarctica or Sydney. Am I missing any good options? You're correct on all counts. Everyone took damage from the event, but you're right about the Will. 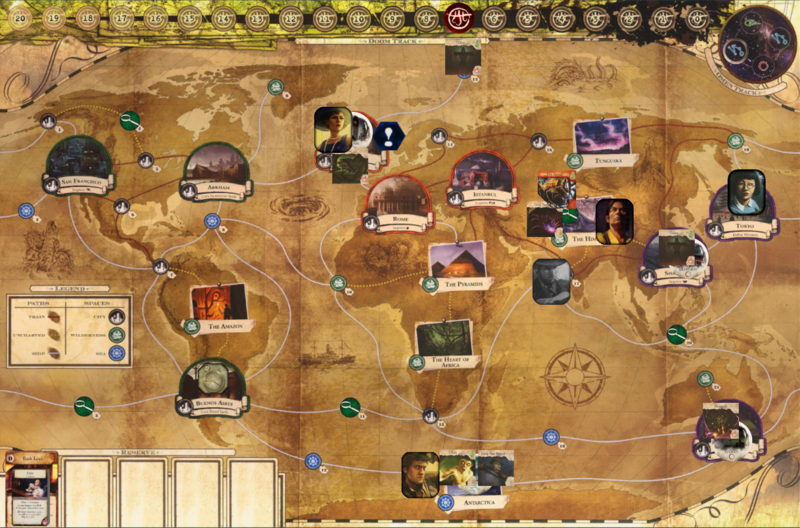 The Shoggoth is not your friend; Antarctica is bound to be the easier of the two. OK. Guess there's not a whole lot I can contribute. I'll use my own action to try to throw away the Ghast: 1, 1, 6, 4, 5. Ghast is gone. Nothing else I can do. Should we dust this off for the holiday week, trigger an apocalypse or two? I'm still up for it whenever. We gon lose but maybe it'll be fun! It's up to False and turtle.